PHILIPSBURG - Gaetano Corallo, father of casino businessman Francesco Corallo, continues to seek money from his son in Italy. The Daily Herald understands that evidence allegedly surfaced showing Gaetano attempting to extort Francesco in Italy where he presently resides. Corallo Sr. was in St. Maarten in 2016 and accused his son of embezzling money from him 30 years ago while he was off-island. Three different sources close to the Corallos suggest that after a private investigation, Corallo Sr. wanted to tarnish his son’s reputation by accusing him publicly of embezzlement. But no evidence of embezzlement has been presented to the Prosecutor in St. Maarten to date that would lead to a criminal investigation, according to the sources. 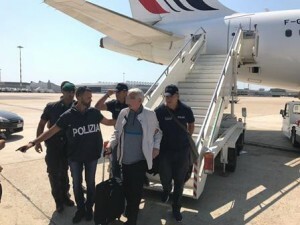 Corallo Sr. withdrew his case against his son late last year after the criminal complaint did not lead to Francesco’s arrest for embezzlement. However, Francesco is considering filing several cases against his father for smearing his name publicly locally and internationally. A long-time family friend and business partner told this newspaper on Wednesday that he was happy with the way things had turned out, because the family had known from the onset that no embezzlement or any wrongdoing had been done by Francesco. “He worked hard for what he has and continues to believe that he is innocent of any wrongdoing,” he said. The casino boss was extradited to Italy last year allegedly for tax evasion and bribery of several politicians and for using his businesses for money-laundering. Francesco maintains that the accusations made against him were not because of money-laundering or bribery, but for having late tax payments that date back to 2006. He said on numerous occasions that those taxes had been paid off in St. Maarten and in Italy. He was released from police custody on his arrival in Italy last year and no date has been set for any court proceedings. Francesco maintains to this day that he is innocent and wishes to have his day in court to clear his name.